If you want to live longer, you will have to stop sitting for long hours. The recent scientific studies have revealed that regular sitting for a long time can decrease the life expectancy. Yet, it is difficult to live by these recommendations, as most of the work nowadays revolves around computers and therefore – sitting. Other activities as well are done by sitting at one place – for instance using the remote control. We all look for comfort, but that does not do us any good, since it has been scientifically proven that sitting is a health menace. After hours of sitting at the same place, the electrical activities in the muscles sow down. Also, the body goes into a mode of storage. The sedentary lifestyle also reduces the physical strength and capabilities to minimum, and it impacts various aspects of your health. Here are ten reasons that explain why prolonged hours of sitting can kill you faster. The American Journal of Epidemiology published a study which showed that women who sat 6 or more hours a day were 40% higher at risk to die over a 13-year-period than those who sat less than three hours. On the other hand, when it comes to men, sitting for more than 6 hours a day were 18% higher at risk of death. Chronic diseases usually occur due to sedentery lifestyle. A study conducted in Australia revealed that sitting for many hours per day can lead to developing chronic diseases like heart disease, diabetes and even cancer. Sitting for a long period of time can also increase the risk of thrombosis. Prolonged sitting is associated with formation of blood clots that obstructs blood flow. Sedentery lifestyle is also very bad for your mind, because inactivity effects your mood and can lead to depression. For instance, one study conducted on women discovered that those women who are physically inactive throughout the whole day are at 99% higher risk for developing depressive symptoms than those who exercised. 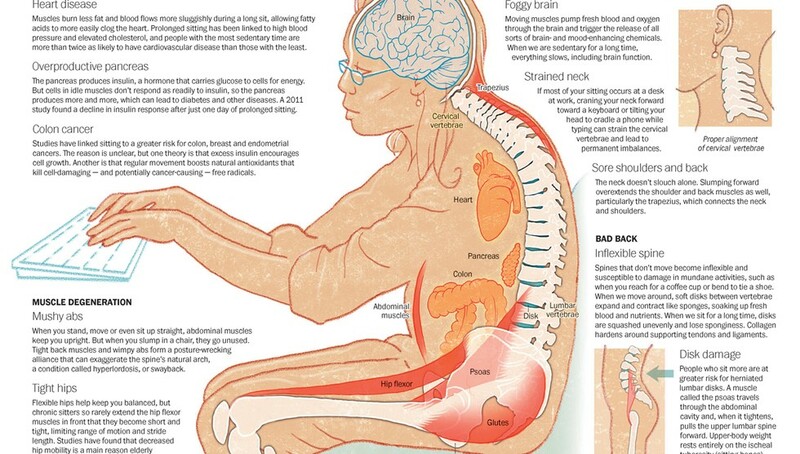 Sitting is also associated to cancers. According to Christine Friedenreich, an epidemiologist at Alberta Health Services-Cancer Care in Canada, physical inactivity is connected to as many as 49,000 cases of breast cancer and 43,000 cases of colon cancer a year in the United States. For instance, when you sit for too many hours, you put pressure on certain body parts like your bottom, and as a result, it produces up to 50% more fat than usual. Sitting is associated with cardiovascular problems. Some researchers found out that people who sit for the majority of the day are 54 percent more likely to die of a heart attack. Sedentery lifestyle is also linked with diabetes. Sitting for many hours throughout the day has devastating effects on insulin resistance and inflammation which as a result leads to developing diabetes. Sitting is connected with obesity and metabolic syndrome as well. Sitting increases plasma triglycerides (fatty molecules), LDL cholesterol , and insulin resistance. To be more clear, the muscles can’t absorb fat, so your blood sugar levels go up. Sedentery lifestyle causes many problems associated with your back. For instance, when we sit for a long period of time, our lower back takes on the weight of the top half of the body, thus putting an unnecessary pressure on it. As you know, our backs are actively working even when we are still, which means that this uneven distribution of weight will create long term problems. The good news is that you can do a lot in order to prevent these health risks caused by long sitting hours. Make sure you do not sit more than 3 hours, and every time three hours have passed, take a walk of at least five minutes. This will prevent all the damage and it can reverse the problems that already have taken place in the arteries of your legs. Moreover, you should perform different regular daily chores and make sure your body is moving between the sittings. Stand in between every hour and take a walk around. Also, do squats; Dr. Vernikos claims that they are an advanced form of standing. Squatting while standing helps your body generate force against gravity.